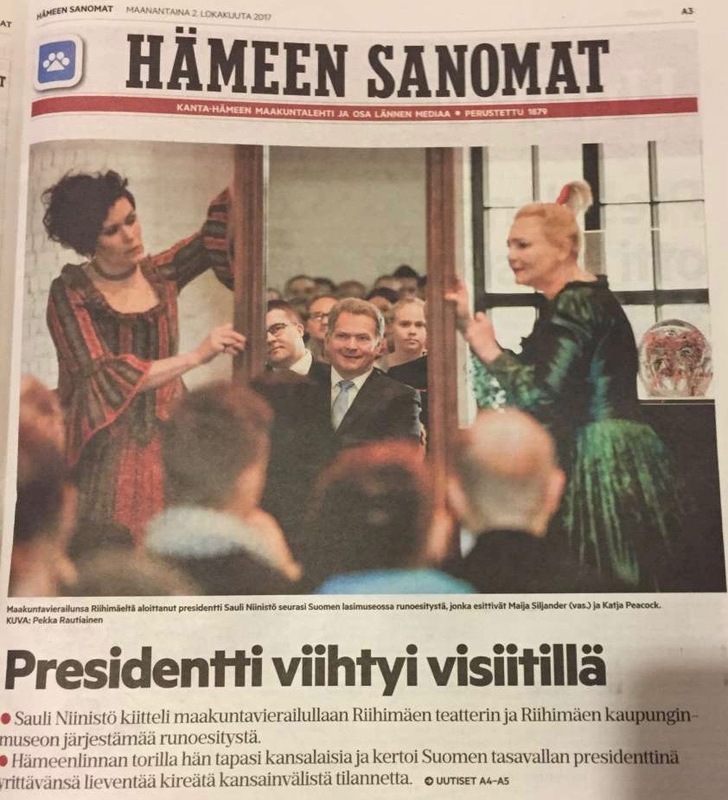 Mr President Sauli Niinistö visited the region of Hämeenlinna and Riihimäki yesterday. In Riihimäki a reception was held for him at The Finnish Glass Museum. Riihimäen Teatteri was there to entertain Mr President, local politicians and kids from Riihimäki Youth Theatre with a poetry performance Ehkä liioittelen vähän. With Matti Arnkil I gave a speech about why Riihimäen Teatteri is the Theatre of the Year. After the performance Mr President understood why. He was very pleased and said that beforehand he hadn’t known how good we are. Well, we were, thanks to the actors Katja Peacock and Maija Siljander! They did a great job. And why wouldn’t they? Ehkä liioittelen vähän is a brilliant piece of poetry on stage. Based on the poems of Anja Erämaja, directed by Taru Kivinen.